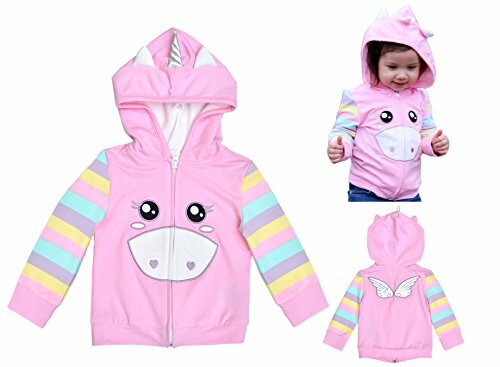 Your little one will be instantly transformed into a unicorn with our magical hoodie. Embroidered eyes, heart, nose, cheeks, and back wing bring this unicorn to life. It's whimsical, special, comfortable and simply wonderful to look at! The pictures can't do it justice, you just have to see it yourself. With a full cotton lining, your child will be very comfortable while she wears it. COMFY: Our unicorn jacket is made of cotton spandex which is super soft and stretch for maximizing your little one's comfort and movement. There is thumb hole to keep sleeves down and keep your kids warm. FUN: Medium weight jacket. All the pattern is made with premium embroidery, not printed. QUALITY: Ykk zipper for durability with stretch soft fabric keeps your little one comfort and warm with style. SIZES: 1 year / 86 CM / 29-31 in / 22-27 lbs. 2 years / 92 CM / 31-33 in / 27-31 lbs. 3 years / 98 CM / 33-39 in / 31-36 lbs. 4 years / 105 CM / 39-42 in / 36-40 lbs. 5 years / 110 CM / 42-45 in / 40-46 lbs. CARE: Machine wash cold gentle cycle/wash and dry like colors/ only non-chlorine bleach/ tumble dry low/ do not iron decoration/ do not dry clean. ABOUT US: Mini Jiji is a fun and functional clothing line for both little ones and parents to enjoy. Super cute design. Super wearable. Designed by a mom in Irvine, CA. Follow us on Instagram @minijijibaby or like us on Facebook @minijijibaby. Premium stretchy and super soft cotton fabric for active toddlers. Medium weight. Perfect for Spring, Fall. Great for layering in winter. High quality embroidery for front eyes, heart nose, cheek, and back wing. Puffy padded ears and silver horn on hood, unicorn face at front with heart shape nose. Irredescent silver back wing. Thumb holes at sleeve cuffs to keep sleeves down and keep your toddlers warm. Front YKK zipper for durability. Machine washable, durable. If you have any questions about this product by Mini Jiji, contact us by completing and submitting the form below. If you are looking for a specif part number, please include it with your message.